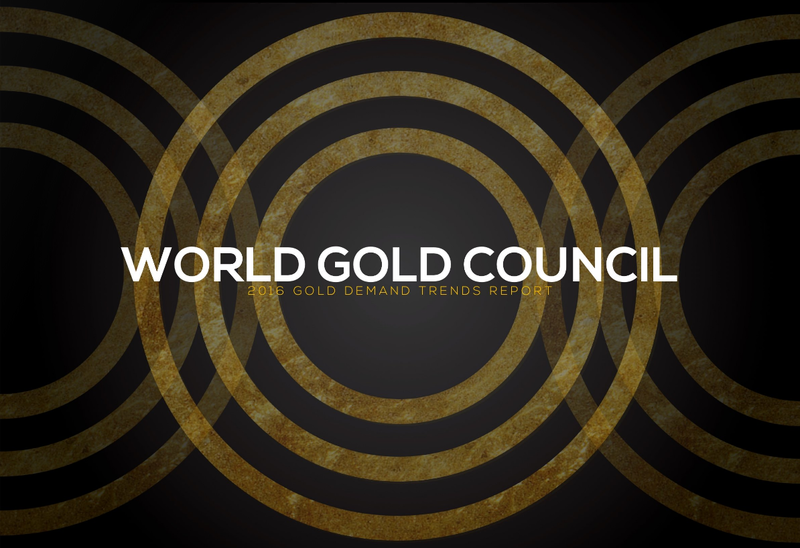 In February the global authority on gold trends, the World Gold Council, released its Gold Demand Trends report for 2016 which revealed worldwide gold demand rose by 2% to reach 4,309 tonnes (t) – the highest level since 2013. The primary driver for the substantial growth in demand was inflows into gold-backed Exchange Traded Funds (ETFs) of 532t, the second highest year on record, or simply put a significant increase in gold demand from professional investors. Gold demand from the capital markets increased by 70% on 2015 numbers contributing to the overall growth for the yellow metal. In terms of gold demand the year was defined by a linear trend through the first three quarters before the market transformed in the final quarter. This can be attributed to the geopolitical headwinds, namely the US General Election, that drastically altered the characteristics of gold demand across the investor side, in private demand and the demand for jewellery. The second influential factor was the unwavering strength of professional investor demand in the first nine months, as mentioned up by nearly three quarters year on year, as capital markets returned to gold at a level that hadn’t been seen since the height of the global financial crisis in 2009. John Mulligan, World Gold Council head of investor relations, says, “Investors were taking current risks seriously and seeking comfort and safety in gold, that was the pattern for the first three quarters of the year. After three successive quarters of growth in demand Mulligan says there was a ‘rush to risk’ after the interest rate hike, based on a sense of optimism that the Trump administration could indicate economic growth in the US. This trend shaped demand for Q4 which saw significant outflows from ETFs of 193t. The outflow activity from the investment sector had a knock-on effect on the gold price which had been gradually rising through the year. Mulligan observes how the jump in gold ETFs sales created downward pressure on the price and having climbed to around US$1,350/oz gold finished the year up by around 8% tipping $1,150/oz. The World Gold Council recognises ETFs demand as a proxy for institutional investment while bar and coin demand is important as a reflection of private investor demand accessing gold. “In Q4 we saw a remarkable response, as the professional investors were leaving gold the private investors turned to gold,” notes Mulligan. Breaking down the 367t figure reveals Chinese demand leaping 86% compared to Q4 2015, a 122t jump in one quarter that Mulligan calls ‘very strong indeed’. The US had a similar increase but in a much smaller volume, 82% at 30t, and Germany – which has traditionally had strong demand – increased 10% to 35t. “The response is driven by two factors, the first is the price drop caused by ETF liquidations which created bargain hunting and released some pent-up demand but it also shows a different awareness of risk from the private market with perhaps a longer term perspective than the capital markets’ short term immediate reaction,” explains Mulligan. There was a distinct divergence in the ETF outflows between US and European traders. The moves out of ETFs were predominant in the US and the UK but not in mainland Europe. Mulligan expresses that this trend is indicative of European investors’ awareness of risk surrounding US policy prospects and the potential post-Brexit environment. With a series of European elections due this year that feeling of uncertainty is likely to continue across the European Union. The demand for gold jewellery, which is typically dominated by the Indian and Chinese markets, underwent a unique year in terms of external factors influencing demand levels throughout 2016. “If the first three quarters of 2016 were driven by uncertainty which benefitted demand for professional investor interest then it actually suppressed demand in the consumer markets, particularly jewellery,” remarks Mulligan. Overall jewellery demand dropped 15% year on year to 2,046t and that decrease is accounted for by falls in India and China, 22% and 17% respectively. Both markets have different sets of drivers and there’s no common theme for the reductions in demand. In China, the overall slowdown of the economy from the unheralded rates of growth seen in the last decade resulted in a lack of consumer confidence, turmoil in the local equity markets, potential bubble conditions in the housing market and a change in taste of the younger generation, Mulligan indicates these factors combined will pose ongoing challenges for the jewellery industry. While India had very different pressures on domestic gold demand. Mulligan points to the jewellers 42-day strike in Q1 which ground the industry to a halt and the November ‘demonitsation’ with the government withdrawing 500 and 1,000 Rupee notes, both having a major impact on the local gold market. “Initially the market responded buying fairly large amounts of gold, but being a cash-based economy and potentially withdrawing 86% so quickly, the flows dry up. Stocks were bought but the resale network found it difficult to restock and the gold industry ground to a halt – two major shocks to the local gold flow in India,” Mulligan says. However in the global consumer market responded well in Q4. The final quarter demand increased by 26% compared to Q3 and Mulligan says gold is unlike any other commodity in its self-balancing nature – if one sector of demand is suffering very frequently another is buoyant. As 2016 was a year of uncertainty and upheaval in regards to geopolitical events, 2017 will pick up the baton as the UK and Europe hash out tempered Brexit negotiations and President Trump begins to implement his political manifesto. According to Mulligan the initial surge in optimism witnessed in Q4 2016 is now being questioned in terms of the long term implications of protectionist aspects on both sides of the Atlantic. “What is good necessarily in the short term for the US economy may not be good for the global economy and there are a lot of questions as to how it will play out for world markets,” he says. There is another danger on the horizon. A lot of the conversations Mulligan has had with asset managers, some who predict a strong US story, indicate the market is preparing for inflation. “A lot of the policy announcements are looking quite inflationary. We need to be prepared for what is now looking like a potentially volatile period of policy announcements and market reactions,” Mulligan concludes.